You’ve got the baking bug and the perfect cookie recipe, but now what? Do your cookies always ooze together as they cook, resulting in a giant cookie blob? Do they come out too crunchy? Do you wrestle with your rolling pin and too-sticky dough for cut cookies? What about the ones that just … taste funny? This post should help you get past these cookie glitches. Do it. Ten to 15 minutes before the cookies go into the oven, you need to turn it on. If you put your dough into a non-preheated oven, they will heat slowly, which means they’ll likely melt into the giant cookie-blob from the Black Lagoon! It’s very rare for a cookie recipe NOT to require a preheated oven. In general, use the ingredients your recipe calls for. If you use margarine instead of butter, you might find that the cookies turn out thinner than the butter version. If you use all-purpose flour instead of cake flour, you’ll find that your cookies are denser and flatter. Using sugar substitutes instead of the real thing can also change cookie texture. This isn’t to say that you can’t experiment, but if you need perfect cookies now, it’s best to stick to the recipe. Make sure your ingredients are high quality and fresh. Baking soda and baking powder are different. Double-check to make sure you’re using the ingredient your recipe calls for! Measure your ingredients properly, whether by weight or by volume. Baking is a science; chemical reactions are occurring as you mix and bake the ingredients, so correct ratios are key! Avoid using too much flour when rolling your cookies. This will make the cookies tough! If the dough is too sticky, throw it into the refrigerator for a few minutes to chill it, then try again. Try not to overwork the dough. This will also make the cookies tough. Roll the dough between two sheets of waxed paper or parchment paper. If you’re working in batches, keep the other dough in the fridge while you’re rolling. If you need to roll the dough ahead of time, you can stack sheets of rolled chilled dough (still in the parchment paper) in the fridge on a cookie sheet! Use good-quality metal cookie cutters. They should be thin and sharp. If you need to use plastic, try dipping the cutter in warm vegetable oil between cuts to make an easier, cleaner cut. Dust your baking pan with a light layer of flour before dropping your dough. This will keep the cookies from spreading as much as they bake. Make sure your dough is chilled when you drop it. This also combats cookie-spreading and tough cookies. Also, make sure your cookie sheet is room temperature or cooler. This means you may need to rinse and chill it between batches! There are many good reasons to let the cookies cool before doing anything else with them, but the main one is to prevent burning your mouth on the first bite! Cool cookies on wire racks so that the heat can escape from the top and the bottom. If you try to pile cookies on a plate or in a cookie jar before they’re cooled, they’ll stick together and you’ll never forgive yourself. Cool your cookies completely before decorating them. This way, the icing, sprinkles, or other pretties won’t melt and run. Try these cereal cookies for a change of pace and an interesting texture. They are pictured above with the cherry on top! 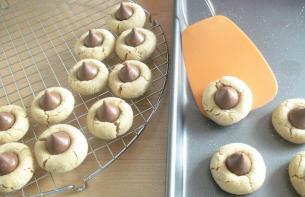 Macheesmo has a wonderful photo-tutorial on Chocolate Thumbprint Cookies. The Pioneer Woman shares her husband’s favorite cookies, oatmeal crisps, and four other fabulous cookie recipes on her website. Joyful Abode features the world’s best shortbread recipe along with tips for dressing it up. Or try Curious George cookies, full of bananas, oatmeal, and chocolate chips. Michael at Cooking for Engineers lays down the science behind peanut butter cookies. Ha-ha! Thanks for the link KGWagner! You’re right, the comment thread is very informative! The cookie jar in the first photo of this post was my mom’s and it sat on the kitchen counter for as long as I can remember. 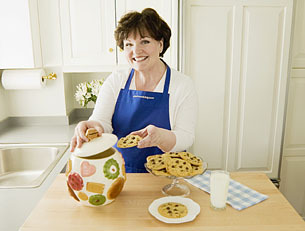 My mom was a great baker and the cookie jar was continuously filled with all sorts of cookies. She loved baking and cake decorating and delighted in everyone’s enjoyment of her creations. Of all the photos on my site, this one is my favorite! Wow! Salomi that’s great to hear! Baking and cooking can be great fun and a wonderful way to bring people together! Enjoy! I made your chocolate chips cookies recipe but they turned out like rocks?? So far the response has been fabulous to my Chocolate Chip Cookie Recipe. There are so many variables when it come to good baking. Measuring must be exact. I prefer measuring by weight but here in the USA, the standard way to measure is by volume. Substitutions when making soups or stews are not difficult, but in baking they are really tricky. (Like margarine instead of butter, whole wheat flour instead of white flour, white sugar instead of brown sugar, medium size egg instead of a large egg, baking soda for baking powder, etc.). Oven temperature and cooking time can also dramatically change the texture of the cookie. The oven must always get preheated! Many times it is just a matter of baking the cookie for a minute or two less. Also, each time you open the oven door you throw off the cooking time. Over mixing or mixing up the ingredients in an order different from the recipe can also change the texture of the cookie. I hope this helps when you try your next batch of cookies! I love this website. Your chocolate chip cookie recipe will hopefully be a success. They just have a few more minutes in the oven. Thanks so much for this website! Thanks for the positive feedback. We hope the cookies were a hit!